Your PC and mobile device don't get to visit very often. In fact, other than special occasions where you're transferring that new album or movie over, they barely talk at all. It's time they reconnect--literally. Luckily, Chrome experimenters are playing matchmaker and hooking them up better than ever with these awesome free games. Grab your favorite mobile device with an accelerometer and load up Roll It on your PC--it's time to play some old-fashioned skee-ball with up to three people. 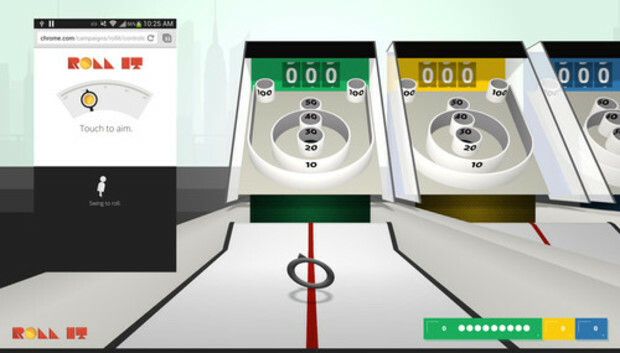 Chrome on your PC acts as the machine while your phone simulates the ball in your hand. Wind your arm back, and swing it forward like you're Wii Bowling and score as many points as possible--just don't let go or you'll be in the market for a new monitor and phone. A few surprise balls show up along the way--this isn't your average Chuck-E-Cheese skee-ball. If your fingers are looking a little flabby, Super Sync Sports is here to get them into beach-body shape just in time for summer. Once again you're going to want to load up your Chrome browser on both your PC and phone to get the most out of this finger workout. Your fingers act as your vital limbs as you run, swim and bike your way through a simple course. The best part? The dozens of crazy selectable characters, all with their own unique and silly tagline. Sync up a few phones to the same game to compete against your friends. This one doesn't require your phone, but you can choose to go mobile or play on the big screen in this classic arcade style shooter using just a browser. X-Type lets you control your craft to take on tougher bosses one after another by moving out of the way of danger and returning fire in any direction you choose. On the phone the left thumb-stick moves the ship (WASD on the PC) and the right thumb-stick automatically fires in the direction you're pushing (mouse and left-click on the PC)--it's intuitive but your thumbs may get in the way when the *expletive* hits the fan. Taking after popular apps such as Temple Run, Run Pixie Run puts you in the wings of a frightened pixie flying through obstacles to collect happy things such as watermelon, candy, pandas and ukuleles. Collect enough and it will activate your pixie power that takes away the obstacles and puts you into some rainbow supersonic speed mode. When you want to play on the go, its compatible with nearly every mobile browser--no app install needed.